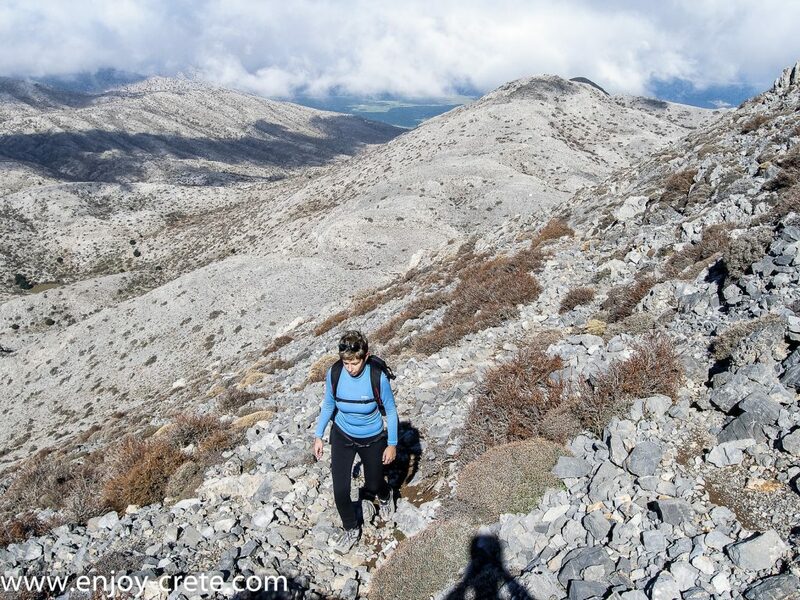 if you have time to summit only one then you wont be disappointed by reaching the top of Dikti mountain and Spathi summit. The topology of the mountain range is rich with a lot of plateaus (Lassithi, Katharo, Omalos Viannou, Limnakaro), valleys and secondary peaks. 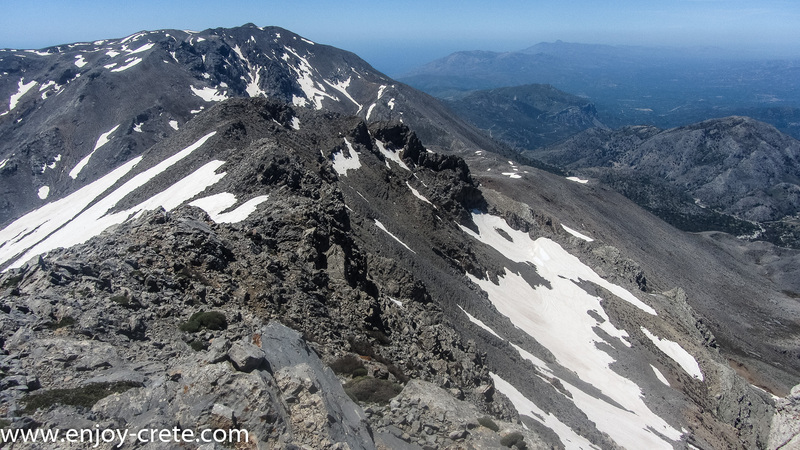 Some important peaks apart from Spathi 2148m are Afentis Christos/Psari Madara 2141m, Lazaros 2085m and Madara 1783m. In this hike we will start from Limnakaro plateau at about 1050m altitude and reach the summit of Spathi at 2148m. It is a steep ascent with very rock terrain. Large areas of the mountain are forested with pines (Pinus brutia), Kermes oaks , cypresses , Holm Oaks and Cretan Maples. The trip has easy access for those staying in or near by Chersonissos, Stalis, Malia, Milatos, Sissi, Elounda and Agios Nikolaos. The fertile valleys and plateaus of Dikti are of significant importance to the local economy. 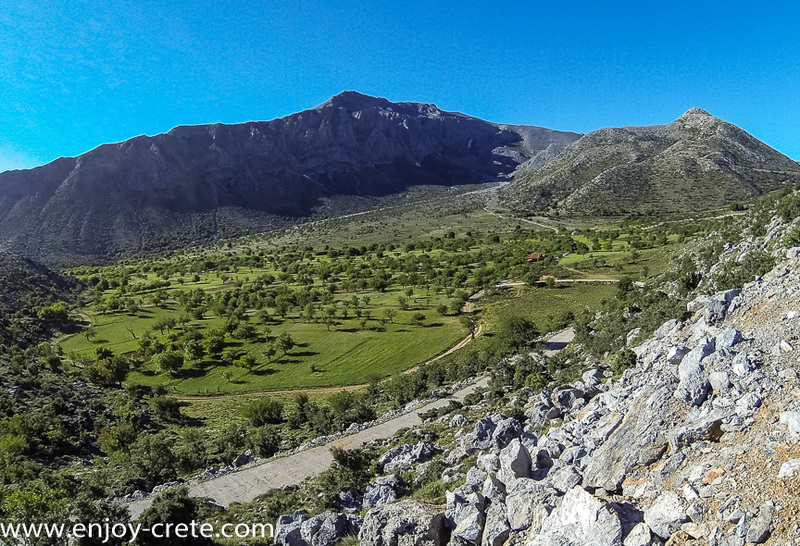 Dominant feature of Dikti is the Lasithi Plateau, the largest and most picturesque plateau in Crete. It is a place with great history. Diktaion Antron, is located here, a cave where -according to the Mythology- Zeus was born. In a different myth, Dias (Zeus) was born in Idaion Antron in Mt Idi. A third myth is a compromise of the two, claiming that Zeus was born in Diktaion Antron but raised in Idaion. 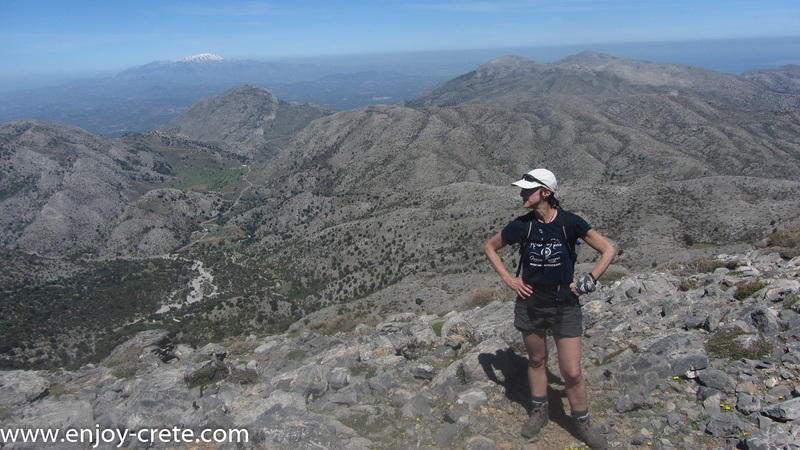 The Lasithi Plateau is a nice place for pleasant excursions. 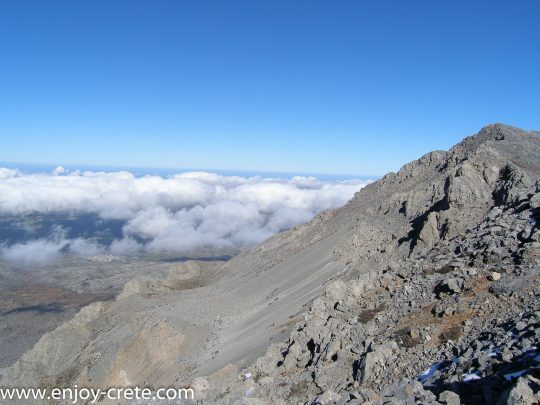 During this hike the group will reach the highest summit of the mountain, Dikti at 2148 meters. 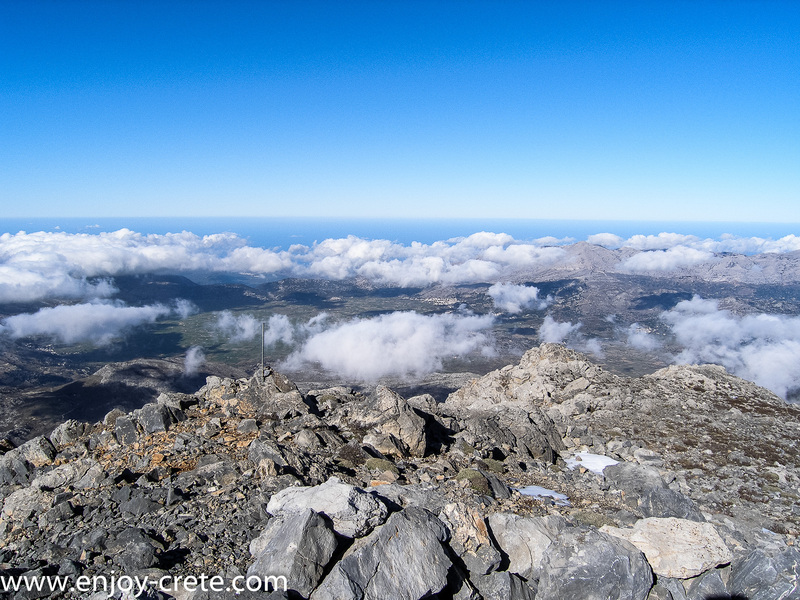 You will have an outstanding view from the summit, including the Aegean and Lybean sea! A superb hike. Spathi summit with Limnakaro plateau in the front. You will need to pack your lunch. Other than that you will need at least 1.5lt of water (ideally 2-3 during the summer months),day-pack (approx. 35-45lt),sun glasses, hat, sunscreen, light jacket and good hiking shoes. If coming during the winter you need to have a full winter mountaineering clothing as temperature can get below 0oC near the summit. If we pick you up we will send you the exact meeting point otherwise we will meet in Lasithi plateau near Avrakontes village. Click here for the exact spot. 10 am during the summer months and much earlier during the winter. Will be in touch via email with the exact meeting time. We pick up clients from Heraklion, Chersonissos, Malia, Kokkini Chani and Stalis. Many times we are able to pick up clients from other locations as well but it needs to be on our way to the starting point. If you need transport and you are not sure get in touch with us. Remember to send us the exact location of your hotel, not just the name. Transport is provided for free. What will happen If weather is bad? If weather is bad and we will cancel the trip a full refund will be given. An alternative hike might be suggested if possible.